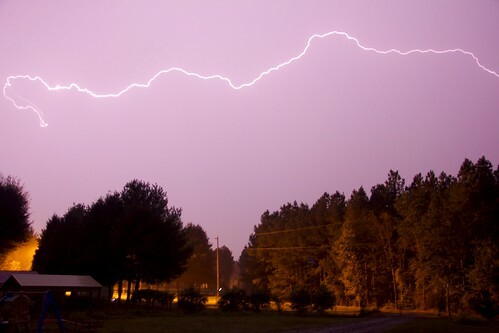 It has been awhile since I have had the chance to photograph a good lightning storm. My chance came a few nights ago when we had an almost stationary storm sit South of me to around 2 hours. It provided a wonderful opportunity to do some long exposures. Not bad for a nice evening on the front porch. 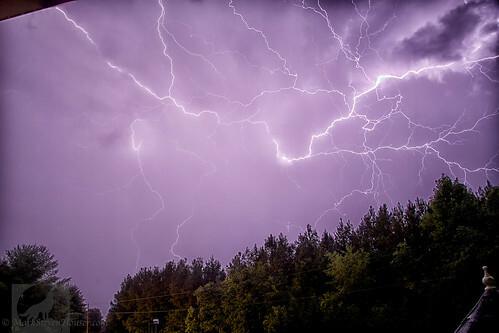 One genre of photography really excites me, and that is weather photography, especially pictures of lightning, thunderstorms or violent weather. Every time it comes a thunderstorm I just have to watch it. Back in May of 2010 I had just come home from work. It was a Friday and after supper we sat on the back porch and watched a distant storm form the the North. As the sun set the light was illuminating the ever drawing closer thunderheads. I got this wild idea that maybe if there was some lightning, I could capture it with my camera. As the thunder became closer and the lightning became brighter I had my lens pointed at where the storm looked like it was heading. When setting up for lightning shots I often use my iPhone to see if the radar track of the storm will come close enough to capture the lightning. This has saved me from wasting many hours waiting for the storm to come when it has fizzled out before it reaches my location. The shot above was my best one of this storm. I basically closed the aperture to f22 and opened the shutter for 30 seconds. The pic is a little noisy (or grainy) since I bumped up the ISO to 1600 but I kind of like it. The focal length was 18mm so I was shooting pretty wide. I was also using a tripod which is a must for long exposures. After looking at my images on the much larger screen and seeing that I had actually captured some lightning strikes, I was hopelessly hooked. I wish I could find a safe location that had long views so I could capture longer strokes, but doing it from home allows me to setup quickly and react quickly to changing weather conditions. I waited almost two hours for this storm which by the time it got to us, it had really weakened. It did produce this cool streak though. The shot above was taken roughly 20 minutes before an EF2 Tornado came ripping through the small community of Vale. 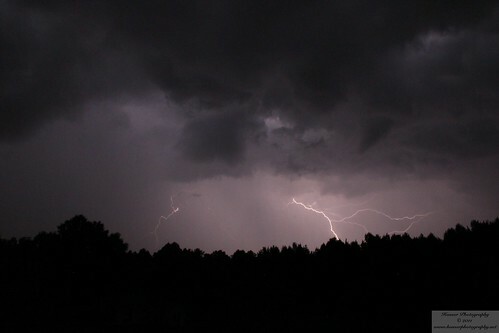 The storm did not produce heavy lightning, so I was very lucky to capture this shot. Shortly after I took this, I took cover as the wind and rain intensity picked up. After a minute or two later I became brave enough to watch as the wind (later a confirmed tornado) popped transformers along the road a few miles away. I could see the flashes and thought they were lightning, but the rumble never came. 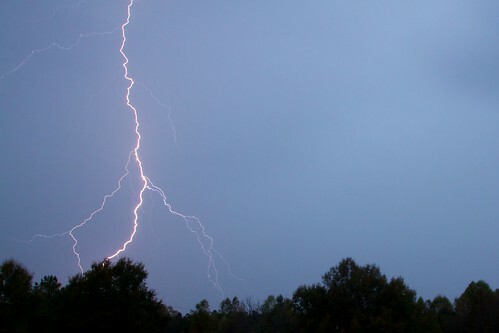 So lightning photography can dan be dangerous and very challenging, but very rewarding when you capture the strikes! Looking forward to what I will hope be a spectacular lightning season in a few months. Hoping that no one gets hurt or property damaged but I hope for a good show!